Presidential spokesman Harry Roque who backed claims of a coup plot against Duterte today. 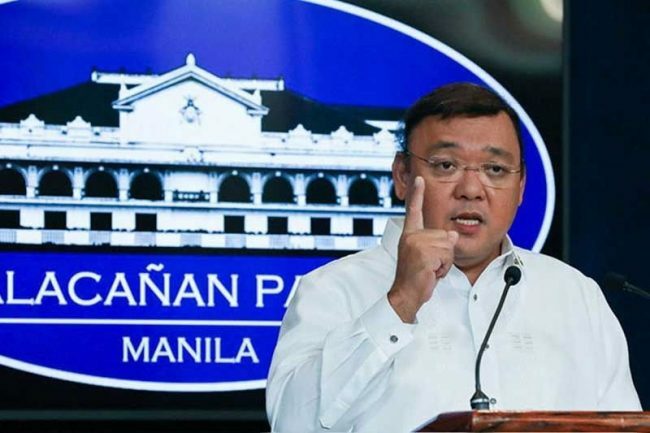 Presidential spokesman Harry Roque has backed claims by the country’s armed forces that there is a coup plot against the administration. However, he said today (Monday, September 24) that communist rebels and opposition figures never succeed succeed in overthrowing President Duterte. He said the Armed Forces’ claim linking the opposition — particularly the Liberal Party, Vice President Leni Robredo, Senator Antonio Trillanes, and groups such as Tindig Pilipinas and Movement Against Tyranny — to the so-called ouster plot was based on intelligence information. “We have no doubts the CPP-NPA [communists] has been out to overthrow the government since they were founded. “We have no doubts there are power-hungry individuals in the opposition who would like to resort to extraconstitutional means to bring down the government of President Duterte. “We have no doubts the Magdalo Group’s addicted to coup d’etats,” he said in a media briefing. Roque said the uprising scheduled for October and dubbed “Red October” would not triumph. He added that those looking to overthrow the president wanted the power for themselves. “We are confident that we enjoy overwhelming support from the people. Therefore what these groups want to see — the ouster of President Duterte — will not happen. Maraming gahaman. Ang sagot lang namin: Dream on,” he said. The Armed Forces have claimed to have documents proving communist rebels, political critics and opposition groups were conspiring to remove the president from power. However, speaking to CNN today, army spokesman Edgard Arevalo said they were still in the process of validating the claims of a “broad united front” or “grand coalition”. Earlier this month, President Duterte said there was a plot afoot to sabotage and assassinate him. He also claimed to have audio evidence that communist leader Jose Sison, the Magdalo group, and other critics were in constant communication. He added that he would ask the unnamed “foreign country sympathetic to us” that gave him the information to declassify it. Sison has confirmed that his communist group is determined to remove the president from power, but he denied conniving with any serving politicians. He dared the president to present any proof otherwise. Welp, that confirmation makes it official….Duterte was correct in his suspicions. He’s not paranoid….everyone really is out to get him. Better to institute nationwide martial law now, to save this blessed administration from overthrow…so he can continue his successful work of raising the Philippines up into economic bullishness and worldwide respectability. That’s why he’s using the power of government to harass, imprison, and murder them…just like his idol Marcos did to many thousands, and just like Duterte did to dozens as mayor of Davao City. Joe Sixpack’s sarcasm is hilarious! Of course a few statements from the compulsive liars in Malacañang do not give us “confirmation” of anything. Of course there is absolutely no “economic bullishness” in our rapidly descending fiscal situation, and “worldwide respectability” would occur if the people would indeed rise up and overthrow this Constitution-shredding tyrant.